The Hairy Bikers are on their bikes again, searching out the very best recipes from around the world. This time, they're discovering the most delicious food from our favourite Mediterranean countries.Including recipes from their upcoming prime time BBC Two cookery show, The Hairy Bikers Mediterranean Adventure celebrates the culinary delights of France, Spain and Italy.With more of us understanding the health benefits of a Med diet, these hearty and healthy dishes are a taste of the very best holiday memories. Fresh, classic, easy and seasonal, enjoy our favourite Med recipes with the nation's favourite cooking duo! 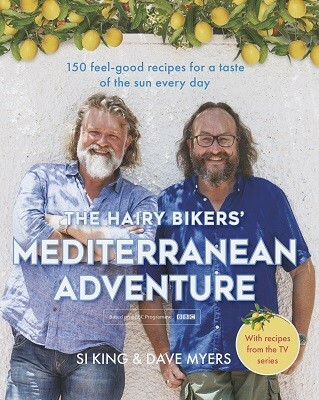 Si King and Dave Myers, aka the Hairy Bikers, have been entertaining and feeding Britain with their unique blend of delicious recipes, cheeky humour and motorbike enthusiasm for years now. They are also the authors of the multi-million selling Hairy Dieters books (The Hairy Dieters, The Hairy Dieters Eat for Life, The Hairy Dieters Good Eating, The Hairy Dieters Fast Food and The Hairy Dieters Go Veggie) which have sold over 3 million copies in the UK. Simple yet tasty recipes. They are a vibrant collection of starters and main courses, with some delicious puddings too. There are some amazing recipes in here. My favourite has to be the one for nutella ice cream! There is something for everyone. A definite read for foodies.